Home » Blogs » Charles Gaba's blog » UPDATE: Pew: 79% now want to keep or "modify" ACA...only 17% want full repeal. UPDATE: Pew: 79% now want to keep or "modify" ACA...only 17% want full repeal. As I noted earlier, much of this falls into the category of "You don't know what you've got 'til it's gone". Fully 85% of Democrats and 53% of Independents now "approve" of the ACA, with only 2% and 15% wanting to scrap it. 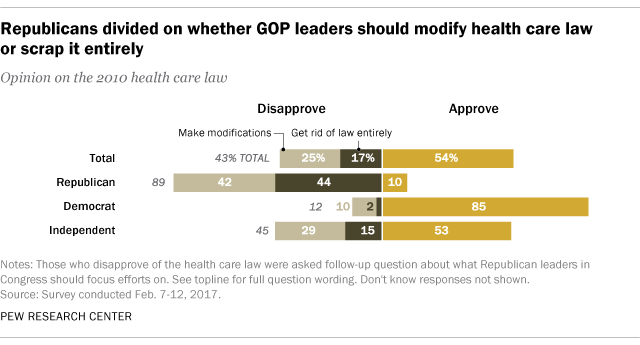 Meanwhile, while Republicans still don't like Obamacare as it stands now much at all (only 10% want to keep it), only 44% of them now want it fully repealed. Overall, 54% now say they approve of the ACA...and only 17% now want to pull it out "root and branch", to use Mitch McConnell's phrasing. A stunning reversal of fortune. The wild card, of course, is the 25% who say they want to "make modifications" to the law. This includes 10% of Democrats, 29% of Independents...and a whopping 42% of Republicans. "Republican leaders in Congress should focus their efforts on making modifications to the law." That's it. Nothing else. Beef up the APTC and CSR subsidies and raise the FPL income cap from the current 400% / 250% up to 600% / 400%. Fix the "Family Glitch" which currently prevents family members from receiving APTC/CSR if one of the breadwinners is covered by a group policy. Make good on the Risk Corridor payments which the GOP insisted be scrapped back in 2014 (and which are legally owed anyway). Find a way to get the remaining 19 GOP states to actually agree to expand Medicaid under the ACA. ...and so on. Every one of these would strengthen the Affordable Care Act, and therefore really belongs on the support/approve side. ...and so forth. Most of these would weaken the Affordable Care Act, although I'm willing to be convinced that going to, say, 4:1 on the Age Ratio might not be a terrible thing, and I'm increasingly thinking that it might actually not be a bad idea to, yes, scrap the employer mandate altogether--but only if the funding provided by that mandate penalty is made up elsewhere, and only if the individual market exchanges are fully supported at the same time. ...or basically a 2:1 ratio in favor of keeping or strengthening the Affordable Care Act. Even the worst case scenario here (if all 25% really do want to weaken/minimize the law) would still be 54% approval, 42% disapproval...still an amazing swing from just a few months ago. The latest Kaiser Health Tracking Poll finds attitudes towards the Affordable Care Act (ACA) have shifted with a larger share reporting a favorable opinion towards the law (48 percent) than reporting an unfavorable opinion (42 percent). This is the highest level of favorability of the ACA measured in more than 60 Kaiser Health Tracking Polls since 2010 and is largely driven by a change in the views of independents, among which 50 percent now view the law favorably. At first glance there seems to be a huge discrepancy between the Pew and Kaiser results...how can Pew find that only 17% want repeal, while Kaiser says it's 47%?? Pew finds 25% want ACA kept, but with "modifications made". Kaiser finds 28% want ACA repealed but not until "details of replacement plan announced". It seems to me that "keep the ACA with changes" really amounts to the same thing as "replace the ACA with a plan that keeps a lot of the good stuff". How many "modifications" can you make to the existing law before it's no longer the same law? There's no specifics about the nature of the "modifications" those 25% want. For that matter, the 28% who say they want the ACA repealed after the "details of the replacement" are announced didn't specify whether they'd still want the ACA repealed once they found out what those details are. What if they can't stand the replacement plan details? -For the first time ever in our polling we now find an outright majority of Americans in favor of the Affordable Care Act- 50% support it to only 38% who are opposed. Only 33% of voters think the best path forward on the ACA is outright repeal, while 61% think it should be kept with whatever needs to be fixed in it being fixed. Q9: Do you support or oppose the Affordable Care Act? Q10: Which of the following would you most like to see the Congress do about the Affordable Care Act, given the choices of keeping what works and fixing what doesn’t, or repealing it and starting over with a new healthcare law? In this case, there is a significantly higher percentage who say they do want to fully repeal the ACA and start over...but it's still nearly 2:1 in favor of keeping the main features of the ACA in place. PPP didn't ask about the circumstances of the "repeal!" crowd either--how many of those 33% want to scrap it immediately, and what if they got to compare the two plans side by side? Q49 Do you think the earth is flat, or not?